Abstract: In the following pages of this review, PCSTATS will be overclocking a 1GB set of Crucial Ballistix PC2-4200 DDR2 memory in bright orange aluminum heatspreaders. Whether you like it or not, it is DDR2's destiny to inherit the world. Like the transition from SDRAM to DDR memory, critics are screaming bloody murder about the lack of a performance increase by moving to a more advanced standard. Like last time this is a necessary move, but the benefits may not be immediately noticeable. It's a required transition, and users really have no choice. On the plus side, DDR2 memory prices have finally equalized, and come down to reasonable levels. Consumers with PC systems based on DDR2 memory architecture no longer have to pay a premium on the type of RAM they need, just to use the latest technology. With all of Intel's recent high-end processors running exclusively on DDR2-based platforms, it is easy to see why migration has been slow. In the medium term, Intel's mainstream 945P/G chipset should help bring the masses into the fold quickly. It's a DDR2-only chipset, supports dual core Pentium 4 D processors, and offers good performance as compared to the Intel 955X (also a DDR2-only chipset). AMD remains in bed with DDR for the moment, but will also make the move to DDR2 RAM sometime in 2006 if things go as anticipated. Crucial is synonymous with reliable memory, and enthusiasts have been flocking to its offerings since the company unleashed its Ballistix series. 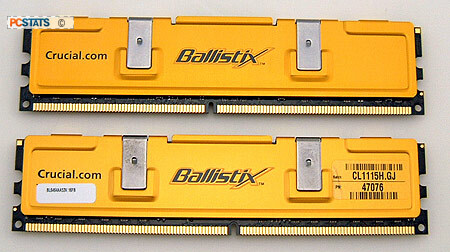 In the following pages of this review, PCSTATS will be benchmarking and overclocking a 1GB set of Crucial Ballistix PC2-4200 DDR2 memory (2x 512MB) which come packed in bright yellow/orange aluminum heatspreaders. The pair retails for about $219 CDN ($181 US). All DDR2 DRAM comes in a BGA packaging, and while this is more efficient and runs cooler than the TSOP-II package, it is also more fragile. This partially why memory makers are protecting DIMMs with heatspreaders. And a word of warning, don't try to remove those heatspreaders unless you want to risk damaging that stick of memory; flexing the PCB will quite possibly break the BGA solder contacts. 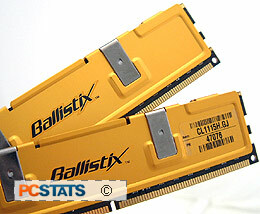 By default Crucial's Ballistix PC2-4200 runs at DDR2-533 speeds with memory timings of 4-4-4-10, at a voltage of 1.8V. Crucial has always been on the conservative side of 'enthusiast' level gear, but we're hoping that this Ballistix DDR2 RAM will still be up to the overclocking challenge. PCstats tests DDR-2 memory on Intel Pentium 4 platform, since DDR-2 has not yet been introduced into the AMD Athlon64 world. While we do test to see how high the memory can go with aggressive 3-3-3-9 memory timings and the 3/4 memory divider enabled, we also loosen things up to see how high the memory can go when not shackled by tight timings. The reason for this extra test is that Pentium 4 systems are not as reliant on lower latency timings as AMD systems are, and having a higher clock speed can counteract the negative effect of higher timings. Because much of our audience is made up of enthusiasts, PCstats also runs overclocking tests so you can get an idea of how far the memory can be pushed. Got that? Good. Let's begin! Things did not start off very well for us because the Ballistix PC2-4200 DDR2 wouldn't run with the agressive 3-2-2-7 memory timings we threw at it right from the start... Its native CAS timings are 4-4-4-10. After about an hour's worth of tinkering we gave up trying to find more agressive timings what would work with the DIMMs, and went forward with benchmarking the Crucial PC2-4200 memory at its stock timings of 4-4-4-10. Starting at 200 MHz FSB, the 266 MHz memory divider was enabled and I began to increase the motherboard clock speed in 5 MHz intervals. Things went by pretty smoothly for the most part, but we hit the first snag at 230 MHz. The system would randomly reset itself when running PCMark04 and drop back to desktop when running X2: The Threat. Increasing the memory voltage to an even 2.0V solved those issues and I continued increasing the motherboard clock speed. We soon experienced stability problems at 237 MHz, this time though the symptoms were more severe; BSODs while loading Windows to no system POST. I increased the memory voltage yet again to 2.1V and things seemed stable once more - the default voltage for the memory is 1.8V. In the end, the Crucial Ballistix PC2-4200 memory topped out at a maximum speed of 644 MHz, or 242 MHz motherboard clock speed. Loosening up the timings past 4-4-4-10 did not seem to help us overclock the memory further, and performance was noticeably worsened. Pg 5. Max Memory OC and DDR2 around the corner!